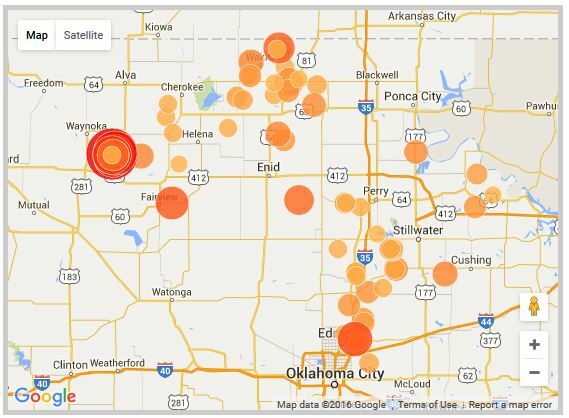 On Saturday, Oklahoma experienced the third-largest earthquake on record in the state, a 5.1-magnitude quake in northwest Oklahoma. It was felt across Arkansas, Iowa, Kansas, Missouri, Nebraska, New Mexico and Texas, and was followed by 10 smaller quakes ranging from 2.5 to 3.9. In response, the Oklahoma Corporation Commission announced that it would implement a regional plan to address earthquakes in the state, which are linked to the large increase in disposal of produced water. A spokesman for the Commission said that “the plan will involve a large-scale regional reduction in oil and gas wastewater disposal for an approximately 5,000 square mile area in western Oklahoma.” The plan is to be released today. A big loser in the Commission’s plan will likely be Sandridge Energy, a company that has invested heavily in production activities that require disposal of huge volumes of produced water in Oklahoma. Earthquakes have also been linked to wastewater disposal operations in North Texas, and the Texas legislature last year funded a study now being conducted under the supervision of the University of Texas Bureau of Economic Geology to investigate the causal link between increased seismic activity and wastewater disposal in North Texas. Although the Texas Railroad Commission hired its own seismologist last year, the RRC has so far refused to admit any connection between quakes and disposal operations in Texas. After a study led by scientists at Southern Methodist University linked quakes near Azle, Texas to two disposal wells nearby, the RRC called two “show cause” hearings to require the companies operating those wells to show cause why their disposal operations should not be halted or curtailed; after those hearings, the RRC held that the companies had proven that there was no causal link between the disposal wells and the earthquakes, despite the SMU study. At a recent forum of Republican candidates for the open RRC seat, no candidate was willing to admit any causal link between recent quakes in the DFW region and increased wastewater disposal activities in that area.